It is more of a queen size than a full, but colors are as expected. Happy with my purchase. Brighten up your space with our fun and classy Pure Melody Paisley Quilt and Sham Set. You can't ignore the beautiful embroidery paired with color hues and classic paisley pattern, bringing perfect harmony to your bedroom décor. It's extra soft and comfy feel will incite you to stay snuggled up in your comfy bed. This quilt is a top seller supply will disappear fast. Soft, washes well, looks good on the bed. It's a different look, using a quilt instead of a comforter, but I like it. I love paisley print, and the colors are good. All in all, it's good. I was hesitant to order this quilt set as it was such a good price I figured the quality would be lacking. Was I surprised when my package came - the quilt is beautiful. Great quality, true to the pictured color and a medium weight allowing the quilt to hang nicely. I wish the width was an inch or two wider, but I can cover my mattress and thats what counts. A very good buy! These quilts fit our twin xl beds perfectly. They are not heavy. Don't show wrinkles. Hang long enough to cover the pillow top matress. They look great. The colors are beautiful and brighten up the room. We are extremely pleased with these quilts. Arrived on time and in excellent condition. This is a nice bedspread. It is not heavily quilted which is great for my needs in the deep South. I am enjoying the blue tones in the spread as well as the touches of gray and black. I'm using it on an extra long twin bed, and it covers it well. The sham is well made. I have washed this set, and it came out perfectly. This has got to be the nicest bedspread I have bought in a very long time. It fits perfect and the colors are just beautiful. I would recommend this if you want a very easy to care for bedspread. Very nice quilt, great price. Design is on both size. Happy with purchase. The colors pictured we perfect. Nice black with a little gray and white. Comes with King pillow covers. It fits and is actually a little bigger so no missing covers when sleeping. Washes well and still looks like new. Happy with purchase. i really love the look and feel of this quilt. The only reason i didn't give it five stars is because it is a little small for my king sized bed. In the photo - it looks fine on the side that is showing - but is only a 8-10 inches on the other side. Ordered two of these quilts.They arrived today and they are just amazing! High quality and an incredible value. Love the shams as they DON'T have that awful ruffle around the edge, they are tailored. Honestly, I would have bought them if they were selling for $100 a piece! Fast shipping too! Thanks! Color is bright powder blue in person. Looks nothing like the picture. Looks like a bedspread you'd find in an outdated motel 6. I'll be returning it. I love this quilt set. The quilt looks just like in the pictures. I have bought many bedding sets from overstock and never seem to be disappointed. Overstock shipping was fast and quilt seems very well made. Thanks overstock. Didn't fit. Won't be buying from Overstock again - charging for returns. I received the quilt and I like it. I like the color and the design. It looks good on the bed. I received the quilt in the time frame that it said it was going to arrive. Actually on the day. I purchased this quilt set to replace my heavier winter comforter. The quality of this set is 100% nice. The fabric is soft to the touch and the quilting in very detailed. It's the perfect weight for spring and warmer weather. The colors are exactly as shown. 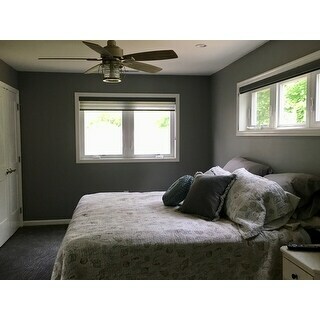 Makes my bedroom look very relaxed, which it should be for peaceful rest. I would highly recommend this to others looking for something a little different for spring/summer peaceful rest. We are enjoying the comfort and versatility of this new quilt. It fits as stated and has a perfect weight balance. Not too heavy, yet keeps you snug. perfect balance and made to last. We love the color combination. Goes well with our room décor. Would recommend to anyone looking for durable, well balanced comfort. Came with oversized pillow cases which fit our king pillows perfectly. You wont be disappointed with this purchase. Enjoy! Pretty but the shipment was longer than anticipated. 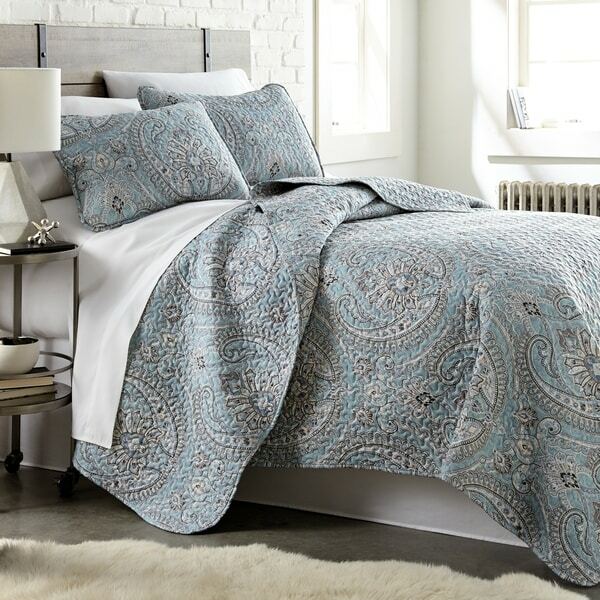 "Does anyone know what curtain would match the aqua Pure Melody Classic Paisley Quilt Set?" "The dimensions stated for the King are 98" wide and 108" long. Did they accidentally reverse the numbers? 98" would be way too short of a width for a king size bed. Seems more likely that it should be 108" wide & 98" long? Please advise. Thanks." honestly - i don't know which is top - which is bottom. I just keep turning it until it fits the way I like. It fits great on my king bed. "Does the Aqua selection haver true Aqua, Gray and Brown in it?" love paisley hoped for quality and a nice spring set.